Manufactured for the school, childcare, Head Start, church, tour and shuttle markets and sold exclusively by Blue Bird dealers throughout North America, the propane-powered vision is built on a purpose-built Blue Bird chassis and uses the Ford 6.8 liter V10 engine with the ROUSH CleanTech liquid propane autogas system. To find a Blue Bird dealer near you, please visit Blue Bird’s Dealer Locator. Switching to propane autogas not only benefits the environment, it also improves fleet operators’ bottom line. Fleet managers are discovering they can lower their fuel costs by up to 40 percent with less maintenance costs over time by switching to propane autogas. Visit the Savings Calculator to see how much money you can save. The Blue Bird Vision Propane school bus equipped with the ROUSH CleanTech propane autogas fuel system delivers excellent horsepower, torque and towing capacity: 320 horsepower and 457 pounds of torque. Whether you are in extreme cold or extreme heat, high or low altitude, or any inclement weather condition, your Blue Bird school bus will start and operate consistently and reliably. 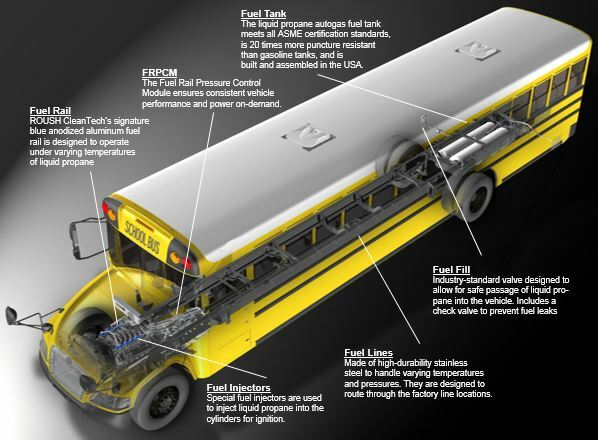 Blue Bird Vision school buses equipped with the ROUSH CleanTech propane autogas fuel system offer a 5-year / unlimited mile limited powertrain warranty, giving you piece of mind. ROUSH CleanTech also offers an optional limited warranty on certain fuel system components, engine Front End Accessory Drive (FEAD) components, Smart Relay Module (SRM) and certain Ford Components for 7 years / unlimited miles. For more information, please view our Limited 7 Year Warranty Statement. 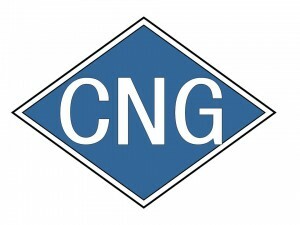 For more information on propane autogas fuel system engineering, click here. Blue Bird offers a complete line of Type A, C and D school buses in a variety of options and configurations. For more than 80 years, Blue Bird Corporation has continued to set industry standards with its innovative design and manufacturing capabilities. Today, Blue Bird has more than 1,200 employees, Georgia-based manufacturing facilities and an extensive network of Dealers and service-parts facilities throughout North America. Its global presence can be seen in more than 60 countries through sales into Africa, Asia, the Carribean, Latin America, Europe and the Middle East. 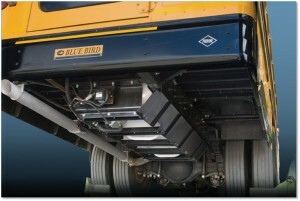 For more information, visit the Blue Bird Corporation website at www.blue-bird.com.